How to Choose the Concrete Mixer? Concrete mixer consists of mixing drum, charging and discharging organization, water supply system, the prime mover, transmission organizations, racks, support equipment and so on. then how to buy the concrete mixer? First of all, choose a suitable concrete mixer, the premise is to clear their site. Clear construction unit time (generally in accordance with the hour) on the demand of concrete so that you can select appropriate type of mixer, and complete the construction. Then, if you choose concrete mixing stations, it is necessary to determine the specific type according to the annual output of the mixer type. Do prospective investment, not a waste of money. 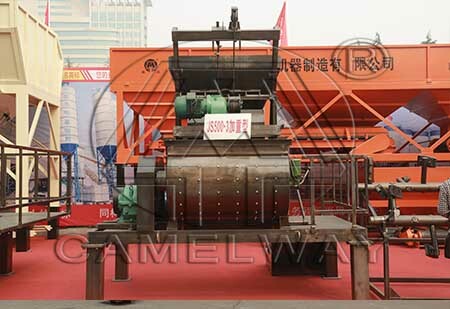 Camelway Machinery suggest that you had better pick the twin-shaft compulsory mixer. Finally, from the perspective of company, you had better choose a professional manufacturer because it can guarantee the quality of concrete mixer. Zhengzhou Camelway Machinery manufacture is one of the large-scale enterprise specializing in construction machinery. The company was found in 1983. In 2000, the company passed ISO9001 Quality System certification. The company has an extensive user base in the country, enjoying a high popularity. If you want to buy the concrete mixer, you can contact us. We will try our best to service for you.